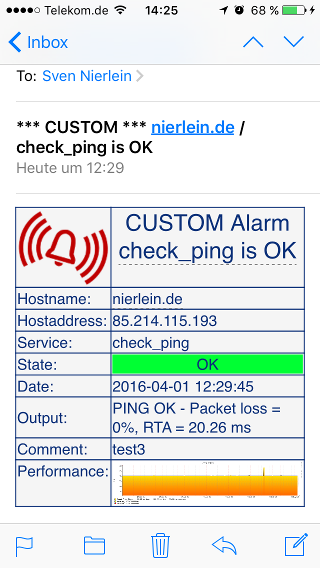 Notifications are part of every standard monitoring installation. But OMD makes it very easy to customize the layout of your email notifications by using templates. the templates from the path above. Starting with OMD 2.20 the html mail commands and templates are included already and can directly be used by assigning the host- and service-notify-by-email-html commands. new commands. The changed parts are bold. Ignoring header field "MIME-Version: 1.0". Now do the same for the host command. Last step is to configure your contacts to use the new html commands. Of course you need to insert a valid email address.